Kevin: I want to like this episode. I really do. It seems like they crammed too much into the story, and none of the threads really panned out. We get another abortive origin story for Odo. Beyond learning that there must be some connection between Odo's people and the planet, we learn nothing else at all. We don't even find direct evidence of Odo's people per se, just another distant genetic relative. Given that the planet has volcanic gas that makes changelings go crazy, there has to be a pretty good story about what happened there, but sadly, we get none of it. Matthew: Yeah, I found the Odo aspects of this episode to be frustrating. The idea of a non-sapient precursor lifeform to Odo? Hasn't this been done? Oh yes, it was done, in "Vortex," which also wasn't particularly good. I appreciate that people are working to release information in dribs and drabs - with respect to Odo, the Dominion, whatever. But consarn it, those dribs had better be fascinating in their own right, and the drabs had better be followed up on. An obelisk that belongs to Odo's erstwhile people? Cool? Learning absolutely nothing about it, and having it figure not at all in the story? Not only lame, but irritating. This kind of BS makes me actively not want to watch something, a la Lost (which I actively stopped watching midway through season one). Speaking of the obelisk, transporting it off planet doesn't seem the most respectful archaeological practice ever. Kevin: The next element is the monster story, and this really all felt out of left field. Once we establish the sample in the lab is dead, and we see the tentacle try to kill Bashir, there's really no other answer than Odo, is there? I also found most the elements of the mystery to be pretty lifeless. The gas is pretty much magic in that it makes Odo forget everything except that he doesn't like Dr. Mora. Bashir's line at the end about not even attempting an explanation was maddening, in that we should actually get one. And this also had strains of Data possession stories from TNG where the fact that the super-powerful person on board seems susceptible to being controlled by an alien force with upsetting ease but we'll still leave him in a position of power. It's particularly egregious since we don't know why it happened or that it won't happen again. Matthew: Yeah, it might have been interesting if the crew didn't trust him. But no, we get the same sort of bland platitudes of trust and friendship that permeate all of Trek. These feelings are fine, unless we're dealing with, as you say, the Super-Powered Guy Who Gets Taken Over Twice A Season. Heck, if even Quark had reacted badly to it, that would be something. Kevin: The most interesting part of the episode was the father/son relationship between Mora and Odo. I liked little dialog bits like Mora referring to Odo's job as his "police thing." It's the perfect slightly condescending way a parent might refer to something their adult child is doing they don't understand or like. I eish the episode had spent more time on it. I think they'll get it right when he comes back in "The Begotten." I liked that they followed up on the dialogue from "The Forsaken," even down to the mimicked hairstyle. This should have been the centerpiece of the episode, but it got consumed by the monster story. The confrontation scenes also didn't quite come off. The argument triggering the change is a little too on the nose and the distraught Mora on the Promenade seemed out of place. Odo is actively trying to kill him and we've already established the gas is responsible, so choosing then to regret his parenting style seemed odd. Anchoring the episode in their relationship, and just their relationship would have made this a much better episode. Matthew: I just didn't get Dr. Mora's turn on a dime against Odo's new life. It seemed like he was all proud and a little wistful, and then BAM he goes full dickhead on Odo, telling him that everyone hates him, he belongs in a zoo, and that past instances in which he professed to like him were FRAUDULENT! Am I supposed to like Mora or dislike him? I can't keep track, and this episode is giving me whiplash. Kevin: While not having anything to do with the rest of the episode, the Quark scene about Plegg was pretty amusing. I also really liked Sisko's because I said so speech with Jake about the Klingon opera. I suppose it was suppose to serve as an example of better parenting experience than Odo's. In any event, the scene was fun to watch. Matthew: You know what, I'm getting tired of saying that random character scenes in a DS9 episode were the highlight of an otherwise dull story. So I'll say the opposite - random character scenes in a DS9 episode highlighted the dullness of the story, rather than ameliorating it. Speaking of character moments, why wasn't Kira more involved in Odo's big life moment? Also, can I just ask, what does the title mean? Kevin: Here, I have fewer complaints. James Sloyan is a good actor and he did his best with what he had. Better scripts in other episodes will serve him well, but he did a good job here as well. There really is a quality to his voice that makes everything he says interesting. The original plan was to cast Rene Auberjonois as Mora, a la Noonian Soong. I am really glad they didn't, as I like Sloyan a lot, and they already did it with Noonian Soong. Of the two episodes he appears in, the other is better, but none of that can be laid at Sloyan's feet in this one. Matthew: Yep, Sloyan is money. He was great as Jarok. He was great as K'mtar. He's going to be great as Jetrel in Voyager. And he does the job despite a weak-ish script here. Even when the character's motives kind of make no sense, the performance keeps me engaged. Kevin: Auberjonois was good, as well. Despite my problems with the plot, his barely restrained breakdown is good, and I like his interplay with Sloyan. It really read as resentful adult child. I also really liked Quark and Sisko in their scenes. Particularly with Sisko, the conversation with Jake about Klingon opera was really cute. Matthew: I thought Auberjonois did a pretty good job of portraying Odo after his infection by the gas. He was just a little off. On the other hand, I'm not a huge fan of his "pain" acting. Kevin: This is where the episode really loses me. The shot of Odo in the infirmary after attacking Bashir was flatly awful. Early 90s CGI or no, it was hideous. Even if standard definition, it was jagged and fake looking. It's like they created a placeholder object and forgot to finish it with an actual surface. The captured Odo at the end was better but still unsatisfying. It was just a sparkly shapeless blob, and as a result, not really scarring. Matthew: You're absolutely right. I wonder if they farmed this out to some other effects house. It was that bad. It looked way different than previous effects on the series, and nowhere near as good. Kevin: The planet surface was nice enough. I like the ruins props. I am not the world's biggest fan of DS9's science lab. It just isn't visually that interesting. There's not much else going on visually in the episode. Though, I will say again that I liked they remembered the story of how Odo got his hair and styled Mora similarly. Matthew: The planet set itself was pretty nice, but the use of a matter painting was pretty obvious. I'm going to blame that o n the camera angle - shooting from above makes it clear that they're on a soundstage, not outdoors. I thought the ferromagnetic fluid was pretty cheesy, as was the glop that O'Brien encountered in the Jeffries tube. Kevin: This is a 2. None of the story threads are really developed enough, and that in combination with the flatly subpar effects makes an episode that is visually and dramatically muddy to watch. 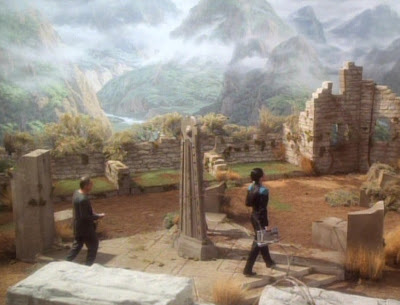 Matthew: DS9 was reallly chugging along, and now it seems like they've hit a wall. A big, fat, season one shaped wall. I agree with the 2 - this episode might be the dictionary definition of half-baked. The toothpick doesn't come clean out of the center of this dud. That makes our total a 4. They were trying (key word: trying) to portray what would happen if a shapeshifter had multiple personalities. I'm pretty sure that's what they were aiming for with the episode title. I think that could be fun, but they should have gone all the way with it. Like when they do Dax's zhian'tara and he manifests physical changes with the personality. That would have been really interesting and let Auberjonois actually act through it. Even if they had handed it to other actors to play other personalities, it could have been really fun. I really appreciate my life on the days I get use the word "zhian'tara" in a sentence like it's a perfectly cromulent word. At least they learned their lesson by the time they got to her zhian'tara? Sometimes, I think that they finally did there what they tried to do here.